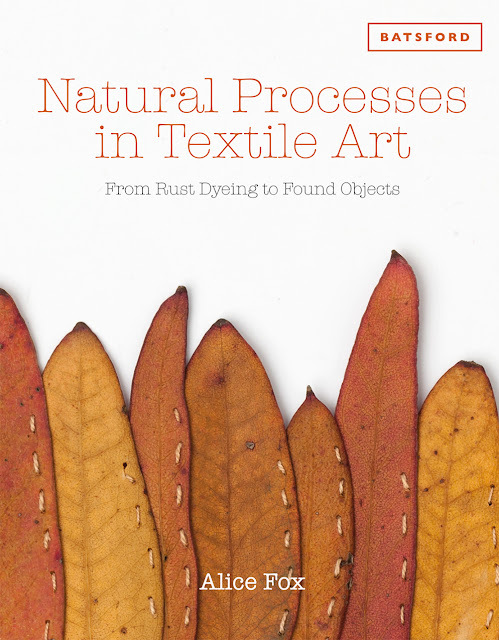 The embroiderer and textile artist Alice Fox has produced an excellent new book entitled Natural Processes in Textile Art. To give some idea of the field of exploration that Alice’s new book covers, its sub-heading is From Rust Dyeing to Found Objects. Working within natural processes, and projecting those processes through the discipline of textile art, Alice shows how to work creatively with your immediate environment, whether by using raw materials that have been gathered from seashore or garden, woodland, or city street. Alice encourages by example, her book shows through simple explanations, how to work in time with natural processes, bringing together the rhythms, complexity, as well as the simplicity of nature into textile art. The book covers such processes as eco dyeing with garden fruits, seaweed and other easily gathered raw materials. Alice shows how using embroidery as a natural process can become an integral part of the work rather than an imposed embellishment, she shows that weaving with beachcombed fibres can add integrity and provenance to a composition, and how printing with found objects can add a depth and direction to the working process. Alice encourages the fostering of a real connection with nature in order to help the creative process. The integration of nature as a driving force in the process of making has become an increasingly important part of the contemporary creative world, and no more so than in textile art. With the textile industry and its subsidiary industries still being one of the planets largest polluters and degraders of the natural environment, it has become a particularly pressing concern for designers, as well as artists who involve themselves with textiles, to start looking for alternatives to the norm. Of particular concern is the use of chemical dyes, their strength, reliability, and endurance once seen as a positive step forward in the world of textiles, is now being seen as a liability at best, a contribution to ecological degradation at worst. The rise in local dyeing, in personal dyeing development, particularly amongst textile artists, has produced a whole movement of experimentation in materials, from leaves and flowers, to fruit and vegetables, from metals, to teas and coffees. Experimentation seems to be the order of the day and Alice encourages, through examples, the fostering of a theme of exploration, of taking a personal journey through the realm of raw materials. All traditional textile processes, whether dyeing, sewing, weaving, and others, can be supplemented or even replaced by materials both ordinary, and indeed extraordinary, that can be found in the natural environment, from fibre for weaving and sewing that can be harvested from the natural world, from grasses, leaves, and plants, to fishing line washed up on a shoreline, all can be used as material, for use in the process and composition of work. All that is ever really needed is imagination, and of course that is an endless and always renewable resource for the artist. To scavenge and forage is part of the human condition, it was a large part of our lives for much of our human history. Hunters and gatherers combed the environment for the useful as well as the intriguing, and the ornamental, and although we may seem to be far removed from our early ancestors, we are not as far removed as we sometimes believe ourselves to be. There is much to be foraged and collected both in the natural and urban environments that can be used as a stimulus for artwork, as well as being integral to the working process. So for example, Alice encourages the collection of leaves, nuts, seeds, lichens, and feathers from woodland, shells, seaweed, plastic twine, and pebbles from the seashore, as well as bottle tops, screws, rubber bands, squashed cans, train tickets and more from the urban environment. Alice is keen for us to not dismiss what could be used as potential, merely because we have never before considered it. To use your imagination, to think about how you could perhaps incorporate the environment around you within your work, is to express that environment, to see its potential, and to celebrate its life. Of course, Alice does make it clear that gathering within the natural environment in particular, has to be done with caution and with understanding. To be in harmony with the environment, to use the gifts of nature, does not mean denuding that same environment. Some plants now have legal protection against random harvesting, and when you are free to collect and harvest, Alice encourages you to show moderation, with nuts and berries for example, you are often sharing a crop with the wildlife who depend on what you are harvesting to sustain them, either immediately, or through the long winter. It is all a matter of empathy and understanding. If you are going to use the environment around you then it is a good idea to try and make sense of that environment, to see it as a complicated interaction between countless species, of which you are one. By all means gather raw materials for your work, but remember that you are only one of the creatures in the complexity, so show compassion to your fellow spirits, be generous, and the environment will be generous back. Natural Processes in Textile Art includes examples of the work of a number of leading artists who are well known within the field of eco textile processes, whether that be through dyeing, construction, printing, stitching. Although this book is aimed at textile artists, and those wanting to pursue or expand their repertoire within the textile field, it is also an invaluable resource for anyone wanting to include and incorporate an element of textiles within their own work, so would be ideal for those working in some of the connected disciplines such as mixed media, basketry, jewellery, ceramics, and as far afield as 3D sculpture and fine art painting. A great book to own, and a great resource in which to look for other means of approaching the world of making.